Using the Atacama Large Millimeter/submillimeter Array, scientists discovered an outflow from a young protostar, marking a dramatic step towards understanding the earliest stages of a star’s life. IRAS 16293-2922B is a very young star – a protostar – perhaps only about ten thousand years old. Slightly smaller in mass than our Sun, it is still deeply embedded in its surrounding natal material, and apparently is even accreting some of that material onto a circumstellar disk that rings the protostar. 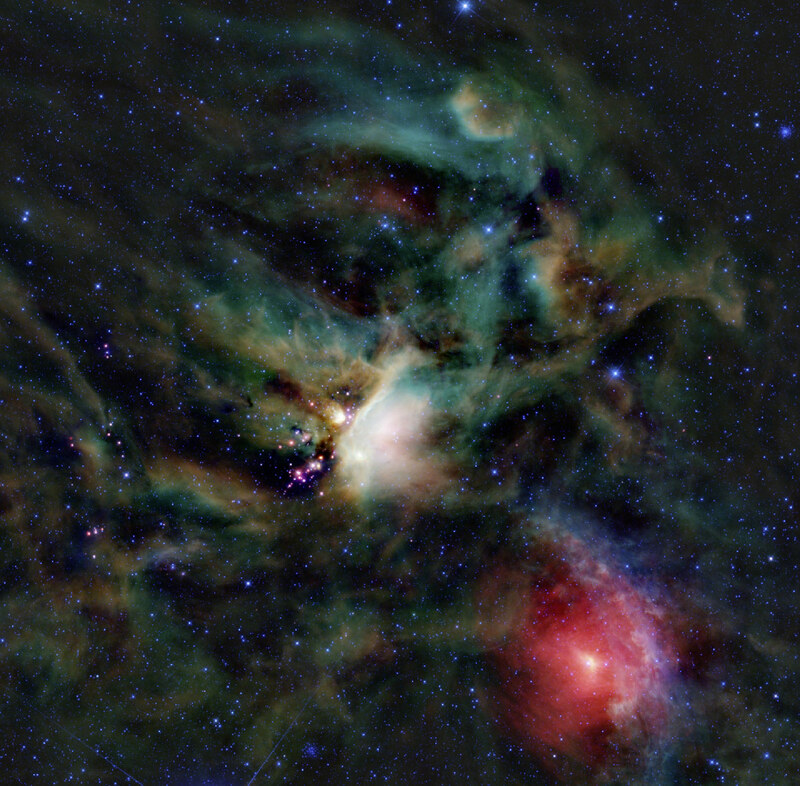 In the past decade, it has become possible to study such extremely early stages of star formation thanks to submillimeter and infrared telescopes that can peer through the heavy obscuration of dust in the birth clouds. For the first time, astronomers have been able to address some of the key physical processes underway in these early stages of stellar gestation. One of the key puzzles is how new stars rid themselves of angular momentum: As the material in the cloud contracts under the influence of gravity, slight rotational motions will spin up considerably for the same reason that a twirling skater will spin faster when pulling in her arms. For the developing star, the consequent centrifugal force can stymie further contraction, and so a star needs to find a way to dissipate the effects. Astronomers think that stars develop bipolar jets of material that channel the spinning material into outflows that can escape and allow the contraction to continue. Indeed these outflows, often dramatically narrow and long, are commonly seen. But how early do these flows develop, and how effective are they at enabling the young star to continue its growth? CfA astronomers David Wilner and Paul Ho, with eleven colleagues, used the giant new Atacama Large Millimeter/submillimeter Array (ALMA) to discover and study an outflow from IRAS 16293-2922B, making this the youngest outflow from what could be one of the youngest stars ever seen. ALMA, is a collection of sixty-six 12-meter and 7-meter diameter telescopes observing at millimeter and submillimeter wavelengths from a high-altitude plateau in the Atacama desert in Chile. An international effort, ALMA only just this month began its routine operations phase, and star birth is expected to be one of its principal research activities. The new paper estimates the age of the young outflow as a mere 200 years from its morphology; the results mark a dramatic step towards understanding the earliest stages of a star’s life. 1 Comment on "Scientists Discover an Outflow from a Young Protostar"
well, if the dirty gas(gas already used and containing heavy metals) reaches the star it stops developing? Perhaps only pure gas furnishes a star with development material. If that is so, then only a star that has its growth stymied with dirty gas has gas jetting from the accretion disc. Pure gas would continue reaching the star furthering growth hence no jetting.